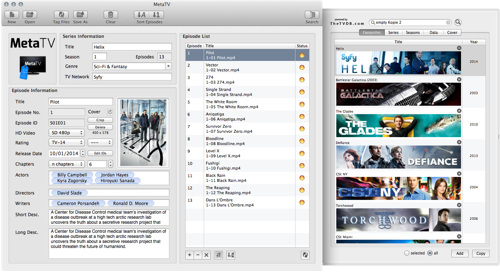 If your TV shows collection looks poor in iTunes, MetaTV can help you. MetaTV collects all information about your TV shows, seasons and episodes for you. Actors, air dates, content rating, overview and cover arts are provided by TheTVDB. MetaTV offers you an easy and intuitive way to add all the information to your video files. You will be amazed, how your TV shows in iTunes look like, especially on your AppleTV or iPad. And how does it work? Very easy! Drag your episode files, belonging all to one TV show and season, on the episode list of MetaTV. You can arrange the files by dragging and dropping them to the correct episode entry in the list or you let MetaTV do the work by using particular filenames, including the season and episode No. (e.g. "S02E05" for season 2 and episode 5). Then search for your TV show in the seach drawer. MetaTV looks for matching TV shows in TheTVDB. Select the correct show out of the list of matching TV shows. After that, double click your season. MetaTV starts to load the list of covers for the selected season. Now you can choose the cover you like. By pressing the "Copy"-button you transfer all the information to the episode editor. If you want, you can edit the information of any episode before saving them to your files. Finally press "Tag Files" and in a few seconds all the episode information is stored in the corresponding video files. Now you can import the tagged episodes into your iTunes library. iTunes displays your TV shows with a nice looking cover and on your Apple devices you can see all the information about your TV shows and episodes. Once you have searched for a particular season, you can access it without a TMDb-search via your favorites tab in the search window very quickly. MetaTV supports the actual MPEG4-standard formats .mp4 und .m4v. The m4v-format is recommended for iTunes. With "Save As" you can create copies of your original video files at any place. MetaTV creates a directory with the TV show name and a subdirectory with the season No. In the preferences, you can adjust, that MetaTV renames your files after tagging to standard iTunes like filenames. This option is very helpful, if you manage your iTunes video collection by yourself. This option is only applicable for files located in your working directory, which you can select in the preferences.